Couple whose farm was destroyed and whose son died in Lebanon create date orchard, exporting the organic fruit to people around the world. Yehoshua and Rachel Meshulami experienced a lot: expulsion from their community, the destruction of their farm, and the death of their son in Lebanon. “The orchard is our eternal possession,” Yehuda says. As the BDS organizations continues to use all its powers to influence grocery stores and supermarkets to boycott products from Israel, Judea and Samaria, those most harmed are the small businesses and producers of Judea and Samaria, whose products are marked at best and are taken off shelves at worst. To counter that situation, a project called ‘Lev HaOlam’ was created. It seeks to fight against the boycott and BDS organizations by assisting small businesses in finding other ways to reach consumers around the world. Every month, ‘Lev HaOlam’ sends thousands of packages with products from Judea and Samaria to Israel supporters around the world. The packages contain a new mix of products every month and include a wide selection of products such as food, cosmetics, art, Judaica, and more. This past month, Israel supporters abroad received packages with wine from Gush Etzion, tehina from Mishor Adumim, dried tomatoes from Tekoa, and dates from Mevo’ot Yeriho. The dates had a particularly amazing history that is worth telling. In the summer of 2005, the Israeli government expelled Jewish communities in Gush Katif and turned the land over to Arabs from Gaza. Among those expelled was the Meshulami family, consisting of Yehoshua, his wife Rachel, and their 17 children. In Gush Katif the family operated a large poultry farm. Yehoshua and Rachel were people of the earth and stayed connected to the land. Following their expulsion from the community that they loved so dearly, the family moved to the town of Yevul, but they did not succeed in recreating the poultry farm they had. Their son, Ami, had been killed in the battle of Saluki during the Second Lebanon War. Despite the extreme loss they felt with the passage of their son, Yehoshua and Rachel knew they had to continue developing the land of Israel by trying something else. 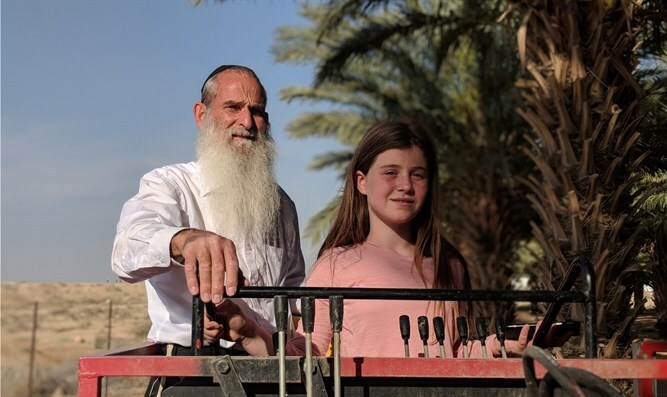 They moved to the town of Mevo’ot Yeriho in Judea, where Yehoshua planted 40 dunam (9.9 acres) of date trees on land that was barren and undeveloped. He dedicated the orchard in honor of his son Ami. The dates from that orchard are the very ones that were sent to Israel supporters around the world this past month. When asked about his orchard, Yehoshua explains how he harvests the dates and the efforts he invests to create the healthiest, tastiest dates, all without using artificial pest controls. “Once a year, like all fruit trees, there is the time to harvest the dates. The specific dates we grow are Majhoul dates and their harvest is in September. Overall each tree gives about 100 kilo of dates every year,” explains Yehoshua. The Meshulamis’ orchard consists of about 500 date trees. Yehoshua explains that the reason he chose to grow dates is because the climate in the Jordan Valley, where he lives, is perfect for them. “Dates are the fruit that is best suited for this special place. Dates need heat, dry air, and to be watered. They are the fruit of the desert. The desert is dry and hot, but near a spring, the date trees can grow. The Jordan Valley is indeed hot and dry,” he explains. “We then only needed to add water. We use drinking water to hydrate the trees of the orchard in order to get the best dates. “Everyone knows that their dates are the best dates around. It is my great honor to share their fruits with Israel supporters around the world. There are left-wing groups that try to harm the orchard, but with great faith they continue onward.